Lesson One: Focus on small, attainable iterations because hope and momentum are incredibly powerful. Because my goal was small and focused, it made it much easier for me to really pay attention to the experience of drinking water before meals. And one thing I noticed was that the time I spent sitting and drinking that water turned into a tiny ritual within my day - I was using that glass of water as a small break in the frenzy. It was a moment where I could collect my thoughts and take a breath, and I began to drink the water away from my phone and laptop in order to maximize that moment. You see what I did there? I noticed. I noticed like a boss. If we are hoping to make lasting change, we not only need to try new things, but we need to take note of what does and does not work. Sometimes that involves metrics and spreadsheets but sometimes we just need our eyes and ears. Each new iteration towards a goal needs to build on what we learned from the last one. And if we aren’t taking the time to notice, we might miss something important. Not only do small steps mean that we can actually attain our goals, but it also means that we have the space to actually pay attention. 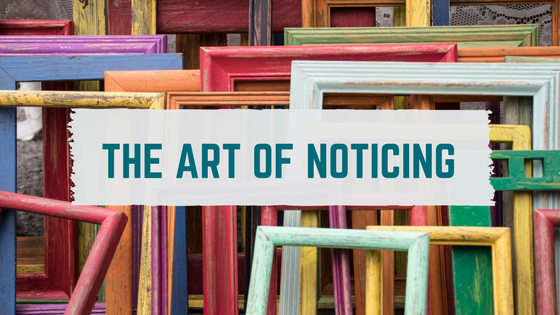 Now, let’s talk about how the act of noticing helps me to adjust my goals.